We first published a research report on USTU back on August 12, 2012 shortly after the name of the shell was changed from Stealth Resources Inc to US Tungsten Corp and a 30:1 forward split was effected but before the symbol change. We immediately added USTU to our list of tickers to watch for a future paid promotion. Read our original research report here. Today USTU traded for the first time and it didn't just get a few nibbles. The stock was shot out of the gate like a cannon ball. The stock price rose from $.26/share to $.32/share on high volume (810,756 shares traded). All total $228,500 traded hands including some big block trades. Today's action screams that paid promotion might be near. In our original research report we learned that USTU has the ideal share structure to justify a high profile stock promotion with 63,750,000 free trading shares owned by the seed shareholders. We also learned that Matthew Markin, the USTU CEO, has connections to past pump&dump tickers like AMLM. Through some further research provided by Otto Rock found here we learn that Matthew Markin is a close associated to Bobby Genovese and was also involved in another pump&dump ticker that got suspended by the SEC called Liberty Silver Corp (LBSV). Learn more about millionaire Bobby Genovese in this PSS research report. Bobby Genovese started as just a scrub working in a boiler room call center in Vancouver 20 years ago that worked his way up and has since made it big building an empire of wealth as a venture capitalist in Florida. See these sites here and here for more information about Bobby Genovese the venture capitalist. Others say that Bobby Genovese is just a stock promoter that made a fortune touting stocks with misleading press releases and dumping stock on the public. Read here (especially the comments), here, and here for more information. Bobby Genovese started Investors Relations Group Inc in Vancouver and worked with his older brother, Richard, there until leaving Vancouver and moving to Florida to start BG Capital Group Ltd. He got involved in two stocks, Clearly Canadian Brands Corp. (CCBEF) and Spectrum Sciences & Software Holdings Corp., now Horne International Inc. (HNIN). 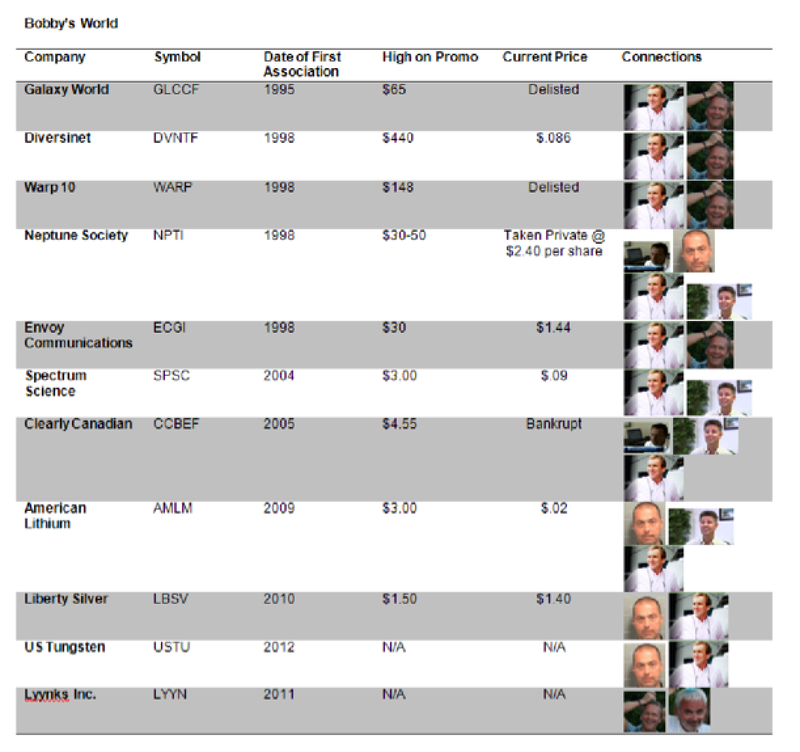 With CCBEF the stock climbed to $4.55/share after Bobby Genovese got involved in 2006. He built a whole reality show around BG Capital Group's effort to turn around Clearly Canadian called Bobby G: Adventure Capitalist. By 2009 CCBEF traded at just $.06/share. Today CCBEF doesn't trade at all. The company filed for bankruptcy because of out of control debts and went private. Bobby Genovese got involved in Spectrum Sciences & Software Holdings Corp (SPSC) prior to his involvement in Clearly Canadian. Spectrum's stock reached a high of $4.02 in April 2004, months after Genovese began controlling a large portion of its shares through dilutive consulting and financing arrangements. Spectrum shares were down to about $1.30 by late May 2004 after the company said the SEC was looking into its dealings with consultants. In November 2005, BG Capital agreed to pay $3.25 million to settle a lawsuit brought by a Spectrum shareholder seeking to recover short swing profits. That same month, Spectrum Sciences said the SEC had concluded its investigation without recommending any enforcement action. See this link for more details. Even more recently Bobby Genovese was linked to another pump&dump, American Lithium Minerals (AMLM) in 2009. AMLM soared to a high of $3.00/share during the promotions then quickly plummeted under $1.00/share. It now trades at just $.03/share. More info here and here. And of course, Bobby Genovese and was involved in recent pump&dump ticker Liberty Silver Corp (LBSV) which got suspended by the SEC. As already mentioned, Matthew Markin worked closely with Bobby Genovese as the CEO of the AMLM shell and was a large shareholder in LBSV. 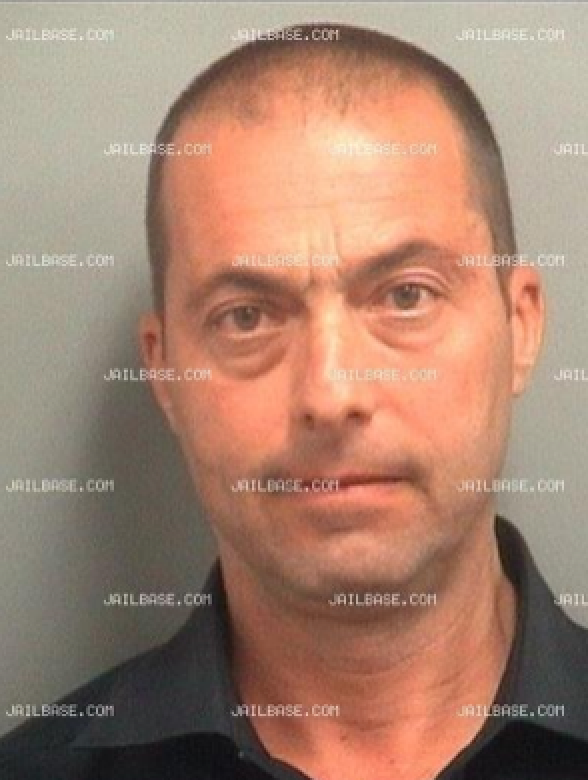 The following is a photo of Matthew Markin taken by the Palm Beach County Police Department on July 14, 2012 when Mr. Markin was arrested for a DUI. Otto Rock's LBSV report is a must read report. Anybody thinking about investing in USTU should read it in its entity. Otto Rock does a great job of mapping the players and linking them to a ring of publicly traded shells all used for insider enrichment with the help of paid promotions coined 'Bobby's World'. Since our August 12th USTU report, a lot has happened with the USTU shell. USTU signed a definitive agreement for a set of mining claims. An option agreement was signed with John M. Pulos and a second option agreement with Paul Antonioli and Ted Antonioli for the Calvert Property, located in Calvert, Montana. On October 9, 2012, USTU announced that they had completed the registration for the property with the U.S. Department of the Interior, Bureau of Land Management, at a cost of $12,285. The latest in a line of announcements for USTU was the appointment of Barry Wattenberg as Treasurer and director of the company. Barry Wattenberg is very experience in publicly traded companies as a former CFO, market maker, broker, and private investor. Barry Wattenberg was a seed shareholder in Kraig Biocraft Laboratories (KBLB). Barry Wattenberg is also the CEO of Potash America Inc (PTAM). On January 6, 2013, USTU launched their website. The domain was registered April 24, 2012 for just one year. USTU is definitely pump ready. The only question left is which promoter will be hired to pump this play. This newsletter is a paid advertisement and is neither an offer nor recommendation to buy or sell any security. We hold no investment licenses and are thus neither licensed nor qualified to provide investment advice. The content in this report or email is not provided to any individual with a view toward their individual circumstances. estocksdaily is a wholly-owned subsidiary of Allan James Group, Inc.. Allan James Group, Inc. has been compensated thirty-five thousand dollars from Keate Group AG for the advertising and promotion of USTU. Companyname: Allan James Group Inc.
IMNG went from $.92/share to $1.10/share before collapsing and quickly falling to under $.63/share. The promo only had about 2 days of life to it before the terrible collapse. IMNG was a re-pump (had been promoted previously by an Andrew Carpenter mailer in early December). For USTU this will be a first time promotion.